What Is The Helios Project? ​The Helios Project is a student-centered endeavor by Pomfret School to create a passive solar greenhouse with aquaponic systems. The greenhouse will help grow produce for over 300 families that rely on a local food bank and for our school's dining hall. Further, it will support our students’ applied scientific and engineering research and act as a gateway to collaborative projects with local, national, and international schools and communities. ​The project has received grant support to build the greenhouse structure, but funds are still required to build the important aquaponic systems and organic soil beds. Your gift will not only help build the infrastructure, it will ultimately provide an important food source! Please help us help the greater community by making a gift today that will allow students to begin construction in the fall of 2016. 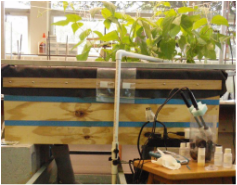 Aquaponic systems are eco-friendly, sustainable organic systems that can grow both fish and vegetables with low resource consumption. Providing all of the benefits of a greenhouse with reduced energy consumption, a solar greenhouse is a vibrant laboratory. Pomfret School is a coeducational boarding and day school, serving a culturally and socioeconomically diverse student body from 25 states and 21 countries.